“Ravishing, elegant pianism!” – New York Times. 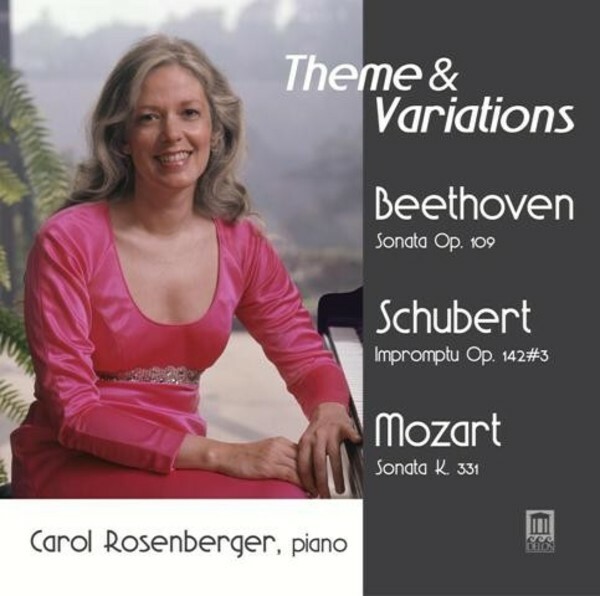 More than any others among the countless critical accolades accorded her, the three words above best express the essence of pianist Carol Rosenberger’s distinctive style, sound and interpretive power. Her more than thirty recordings for Delos – most of them made on 'Bösie', her own Bösendorfer Imperial concert grand – have been hailed worldwide as cornerstones of the recorded piano literature. Moreover, Carol has helped to shape the destiny of the Delos label since the 1990s, working closely with revered founder Amelia Haygood in producing our famous 'Music for Young People' Series. Later she served as Delos’s Artists & Repertoire Director until Amelia’s death in 2007, when she became the label’s director. Carol made this stunning recording in 1997 as a companion disc to one of our children’s albums, but it was not released separately at that time. As opposed to the 'themes-only' approach on the children’s disc, this program offers three great works featuring the ever-popular 'theme-and-variations' format: Beethoven’s immortal Sonata in E, Op.109, Mozart’s ever-popular Sonata in A, K.331, and Schubert’s irresistibly charming Impromptu in B flat, Op.42, No.3 – all performed to enthralling perfection on 'Bösie'.